On February 20, 2007, the U.S. Supreme Court denied the petition for writ of certiorari filed by Clark County, Nevada seeking review of the Nevada Supreme Court’s decision in McCarran International Airport v. Sisolak, 137 P.3d 1110 (Nev. 2006). The Nevada Supreme Court held that Clark County’s regulation of building heights around McCarran International Airport constituted an uncompensated taking of private property. The County’s cert petition was supported by a broad array of airport and aviation industry groups, including Airports Council International – North America, the Air Transport Association, and the Air Line Pilots Association. 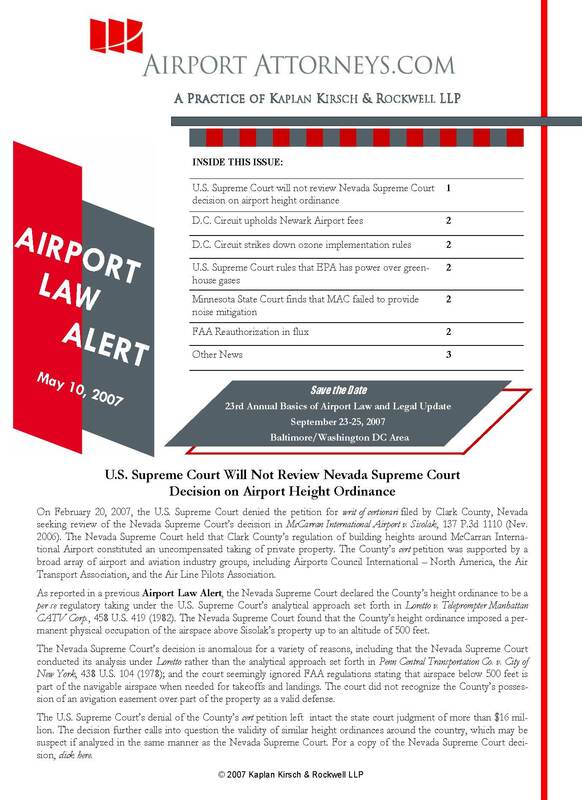 As reported in a previous Airport Law Alert, the Nevada Supreme Court declared the County’s height ordinance to be a per se regulatory taking under the U.S. Supreme Court’s analytical approach set forth in Loretto v. Teleprompter Manhattan CATV Corp., 458 U.S. 419 (1982). The Nevada Supreme Court found that the County’s height ordinance imposed a permanent physical occupation of the airspace above Sisolak’s property up to an altitude of 500 feet. The Nevada Supreme Court’s decision is anomalous for a variety of reasons, including that the Nevada Supreme Court conducted its analysis under Loretto rather than the analytical approach set forth in Penn Central Transportation Co. v. City of New York, 438 U.S. 104 (1978); and the court seemingly ignored FAA regulations stating that airspace below 500 feet is part of the navigable airspace when needed for takeoffs and landings. The court did not recognize the County’s possession of an avigation easement over part of the property as a valid defense. The U.S. Supreme Court’s denial of the County’s cert petition left intact the state court judgment of more than $16 million. The decision further calls into question the validity of similar height ordinances around the country, which may be suspect if analyzed in the same manner as the Nevada Supreme Court. On March 2, 2007, the U.S. Court of Appeals for the District of Columbia Circuit ruled on an airport fee dispute in Port Authority of New York and New Jersey v. Dept. of Transportation, 479 F.3d 21 (D.C. Cir. 2007). The court largely affirmed DOT’s decision that fee increases imposed on air carriers in the international terminal at Newark International Airport were reasonable. The court also affirmed DOT’s decision rejecting complainant’s claim of unjust discrimination. Notably, the court overruled DOT in holding that the statute authorizing “air carriers” to challenge airport rates and charges, 49 U.S.C. Section 47129, did not apply to foreign air carriers, which included 12 of the 13 complainants in the case. The court affirmed DOT’s decision that certain fees were unreasonable but remanded the case to DOT for further proceedings as to other fees declared unreasonable. On December 22, 2006, the U.S. Court of Appeals for the District of Columbia Circuit struck down EPA’s implementation rule for the eight-hour ozone standard under the Clean Air Act. The decision in South Coast Air Quality Mgmt. Dist. v. EPA has affected a number of airports that are located in ozone nonattainment areas throughout the country. The decision has delayed the process of including airport projects in State Implementation Plans, affected general conformity analyses, and may influence the permitting of certain facilities on airports such as heating plants. EPA and other parties filed notices for rehearing of the decision on March 22, 2007, but a decision on these motions is not expected for some time. While EPA has issued interim guidance, there remains considerable confusion regarding the status of Clean Air Act requirements in ozone nonattainment areas. On April 2, 2007, the U.S. Supreme Court held in Massachusetts v. EPA that the Clean Air Act covers greenhouse gas emissions, such as carbon dioxide, from motor vehicles. The Court concluded that the Act provides EPA with authority to regulate greenhouse gases and that EPA’s justification for not exercising this authority was inadequate. The case is of particular interest to airports because it may prompt regulatory measures relating to climate change, including specific measures related to aviation. Indeed, the Clean Air Act provision relating to aircraft engines, 42 U.S.C. Section 7571, is quite similar to the section on motor vehicles that was at issue in the case. In January 2007, the District Court for Hennepin County, Minnesota, granted summary judgment in favor of the City of Minneapolis and other plaintiffs in litigation against the Metropolitan Airports Commission (“MAC”). The court found that MAC had failed to comply with its state law obligation to provide noise insulation in the DNL 60-65 decibel contour around the Minneapolis-St. Paul International Airport (“MSP”) as promised in the Environmental Impact Statement for the construction of the new Runway 17/35 and other documents. After a trial held in February, the court is considering whether the Minnesota Environmental Rights Act also requires noise insulation to protect “quietude” in the neighborhoods surrounding MSP. A final decision from the trial court is expected in late Spring. A separate class action lawsuit brought by homeowners is pending in Minnesota state court. While the debate over user fees for air traffic services has garnered the most media attention, FAA Reauthorization promises to bring significant changes to the AIP and PFC programs and to create several new FAA initiatives. The Bush Administration released its bill, the Next Generation Air Transportation System Financing Reform Act of 2007; however, preliminary drafts of the Senate bill reveal that Congress will approach the same issues from a much different perspective. The major features of Reauthorization should crystallize during the summer months. The Administration’s bill includes elimination of AIP entitlement funds for large and medium hub airports, recalculation of entitlement funds available to other airports, increases in the amount of individual PFCs, and reforms in project eligibility and the process for imposing and using PFCs. The bill also includes a considerable number of other reforms, including expanding the pilot program on airport privatization, creating pilot programs and funding eligibility for certain environmental initiatives, and creating programs and guidelines for airport congestion pricing. A group of airlines operating from Terminal 1, Terminal 3 and the Tom Bradley International Terminal at the Los Angeles International Airport are challenging recent rate increases imposed by Los Angeles World Airports. The dispute concerns the methodology used by LAWA to calculate the fees as well as issues of reasonableness and unjust discrimination. The dispute is governed by the expedited procedures of FAR Part 302. The Administrative Law Judge’s Recommended Decision is due in mid-May. The City of Las Vegas is seeking review by the Ninth Circuit Court of Appeals of a November 2006 decision by the FAA to redirect some aircraft departing McCarran International Airport. The FAA’s decision reinstates a “right turn” for some aircraft departing to the west from McCarran, a move that is intended to reduce delay at the nation’s sixth busiest airport. Las Vegas sought and was denied a stay pending the appeal, arguing that the FAA failed to perform the required air quality conformity analysis before rendering its decision. In January 2007, the FAA released Advisory Circular No. 150/5190-6, Exclusive Rights at Federally-Obligated Airports. The new Advisory Circular continues and further clarifies longstanding FAA policies concerning the prohibition on granting exclusive rights to aeronautical users of airports. In compliance with federal law, the FAA has created a website with links to airport noise exposure maps for many airports around the country. The website contains maps prepared under FAR Part 150 and for other purposes. Airport sponsors are encouraged to review the website to ensure that the maps and information are correct. The FAA will soon release guidance on airport sponsor acquisition, management and disposition of lands purchased for land use compatibility. The guidance is the FAA’s latest response to an audit by the DOT Office of Inspector General in 2005, which found that airport sponsors are not complying with statutory and grant assurance obligations regarding noise buffer lands. In March 2007, Secretary Peters announced the appointment of Kerry B. Long as the new FAA Chief Counsel. The Chief Counsel oversees 258 employees in Washington DC and eleven field offices. Mr. Long formally was a partner with Fulbright & Jaworski in Washington, DC. The latest issue of the Journal of Airport Management is about to be published. The new edition contains an article by Dan Reimer, The law of airline competition in the USA: Recent developments and future outlook. The 23rd Annual Basics of Airport Law and Legal Update will be held September 23-25, 2007, in the Baltimore/Washington DC area. The conference is being presented by the American Association of Airport Executives, the FAA, and Kaplan Kirsch & Rockwell LLP.